Empty you use when you want to start your BPEL process using an Adapter (File, Database, AQ, MQ, etc.). But often developers choose asynchronous and then figure they need to start the process using an adapter but leave the originally generated WSDL. The side effect might be that another developer might try to invoke the process/service using the original WSDL that is in fact not implemented anymore. Fire&Forget is about the same as Asynchronous Request/Reply. Often the terms and their meanings are mixed up. One says Asynchronous but means Fire&Forget. The distinguise is in the fact that with an Asynchronous process you expect an answer and with Fire and Forget you don't. Most of the times (I did that in the past as well) one builds an asynchronous process but does not put a corresponding receive in the calling process. There is little wrong with that. However if the developer even deletes the invoke to call back to the caller, but another developer does put in a receive (it is in fact an asynchronous process, right?) then it waits for a callback that never comes. So I strongly advice in to distinguise between Asynchronous and Fire&Forget, by removing the call-back partnerlink-type and porttype from the WSDL. 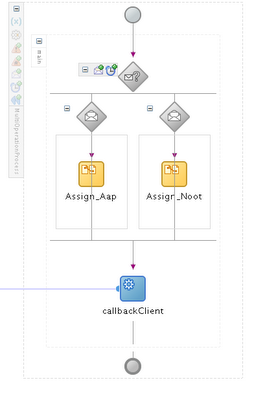 And so delete the corresponding call-back-invoke from the process. Normally there are two ways for invoking these process, corresponding to the type. The "process"-operation for Synchronous and the "initiate"-operation for the Asynchronous/Fire&Forget ones. So that's about it on the invocation flavours, right? Well, not really. There are certain cases that you need to invoke your process in different ways. In the past I build processes that are initiated by one Operation (the initiate for Asynchronous), but I needed to send signals to the running process. For example, I build a schedule process that is initiated to wait for a certain time to do a certain task, based on information in the database. And if that is changed by an end-user, because the scheduled date/time is moved, you want to reschedule the process to have it wait for the new time. Another reason may be that you have to impelement a certain WSDL that is agreed upon (top-down-method). You do that by adding a new operation to the port-type in the WSDL. 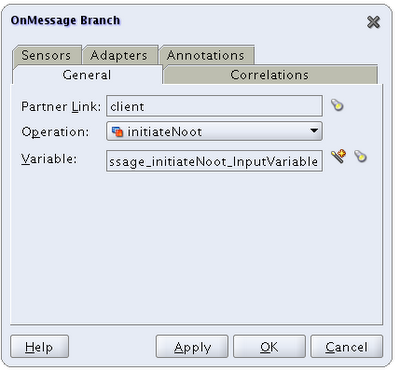 This new operation can have other message-types for input and output then the initiate operation. Schema type and use them as part of the message types. requester portType into an asynchronous conversation. You can even change an existing operation. But then you'll have to change the initial receive: Now you can add another Receive to cater for the receive events of the other porttype. 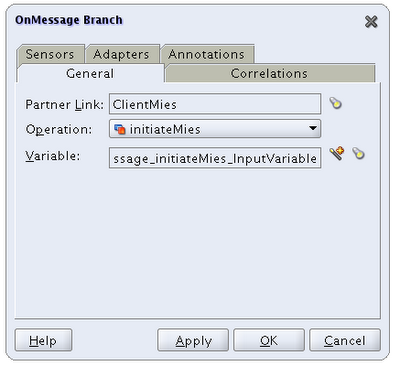 Of course you need a Correlation Set to make sure that the event is sent to the right instance of the process. 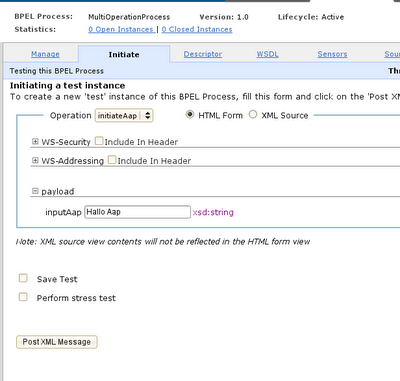 Now you can implement about any WSDL with BPEL. 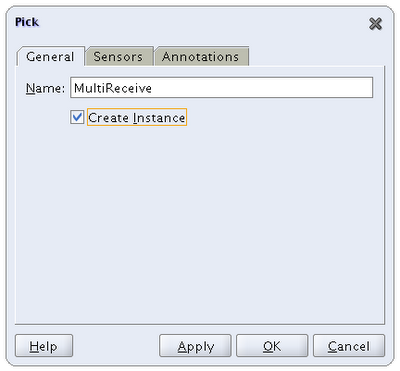 A BPEL process can have only one Receive with the initiate checkbox checked. So there is just one and only one entry point in the BPEL process. This should also be the very first activity in the process. Actually it isn't. That is, if you have implemented an exception handler (Catch/CatchAll) on the outermost-scope. Then the activities in the fault-handlers are the first in the BPEL process. And I found that there is a little pitfall in it. It might be that you have an exception handling bpel-process that you call from the catch-branches. No worries if it is a logging process (Fire&Forget). But if it returns a value to determine if you have to do a retry or an abort, then you have a Receive activity before the first Initiate-Receive! But apparently you can not initiate your BPEL process from the other operations we introduced before. 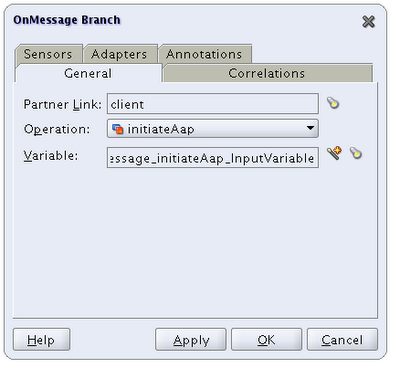 And that makes it only usefull in cases where you initiate your bpel process in one way and have it receive messages over the other operations. If you have to implement a certain WSDL with multiple operations that have to initiate the process: "Houston we have a problem". Until yesterday this is what I believed as well. But I under-estimated the use of the Pick activity! 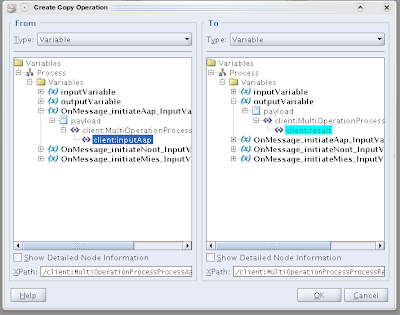 Don't forget to remove the original InputMessage-variable. 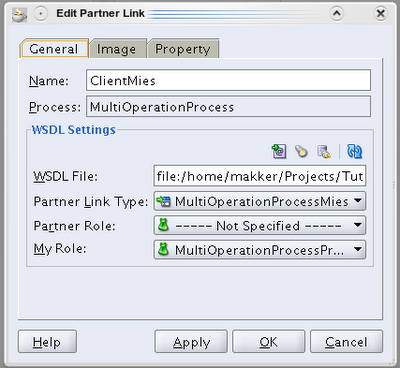 Now you can implement about any WSDL using BPEL, although apparently you're contracted to having one partnerlink-type and one port-type with multiple operations. For me it was a revelation to be able to initiate your process in multiple ways. It might come in handy when you have a case that has some different initiation message but a common process-part. Normally you would create seperate processes to receive the different messages and have them transform them to a common message-format and call the common process. But apparently we can do it all in one process too. You can find my code-examples here. Darwin-IT Professionals is a Dutch Consulting Company. As an intermediary in the Oracle world we focus on the growth of the Oracle professionals market. Our consultants can help you with the realization of your Oracle and Java projects and at the same time work on supporting of your workforce. Through a combination of practical training and personal and subject-specific coaching our experienced professional support starting ICT-associates during the first phase of their carreer within your company. This combination of experienced and starting consultants help you to perform your projects successfully and offers you the possibility to organize the acquisition of young, talented ICT-profesionals in a solid and smooth way. Single Sign On for Apex with ADFS? 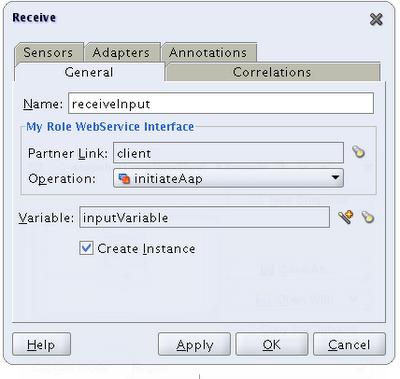 With Weblogic 12c and ORDS: Yes, you can!